Almost every time I walk into the supermarket with my canvas bags someone stops me and says "Oh good for you for remembering your bags, I always forget mine." Well, my memory isn't so great, I just have a lot of bags and try to keep them in my car, so I always have a few with me. 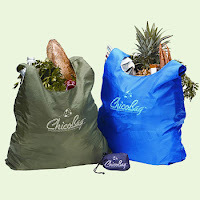 But for those of you who have too much going on to keep tabs on your canvas, check out the ChicoBag (via Tangled & True). It's a full-size shopping bag that folds up and attaches to your key chain! So you're never without a reusable bag. What a great idea! And at $5.00, you can't beat it! I do always forget my bags, especially when I just stop by to grab a couple of things. I'll have to get one of these for my key chain. Love your blog! I've got it bookmarked and can't wait to read more. I thought it was a pretty smart idea, too!